Yesterday was 8 year old Little League opening day for my son. Our family arrived early and the team warmed up before the game. One minute prior to game time, the coach told my son to put on the catcher's equipment. That was entirely shocking as he'd never played anything until 2 weeks ago, let alone catcher with all the gear. By the time he had the equipment adjusted and waddled out to the plate, there was not even enough time for one warm up pitch. So he was catcher never having even caught one ball in that role. Nice! Let me tell you how impressed I was with his performance. And it wasn't just me, a lot of people said He Was Awesome! It was funny being the dad cheering for the catcher and not the pitcher throwing strikes, though I eventually did both. He also got a hit and eventually scored. The team played very well, won, and you'd have thought it was the World Series Game 7. It's been a long time since I've had so much fun at a Little League game! And the season just started. Today I'm drinking Samuel Adams White Ale brewed by The Boston Beer Company in Boston, Massachusetts and a few other host cities. Enjoy by April (2011 not stated). Wheat, lemon and spicy aroma. Wheat flavors and textures are the first things to hit your palate. Those are followed by a little fruity tang, which was a little surprising. Coriander and pepper spices claw their way through the chewy wheat field until they get full recognition. Lemon and orange round out the balance of flavors for this beer. A little sweet though some hops do try to give it a go. Carbonation is medium plus. You finish with more of that thick wheat texture left behind in your mouth. Cotton mouth, we used to call it when cutting weight during wrestling season. Not a pleasant attribute. Not very refreshing on this 86 degree afternoon. All said, decent flavors; the texture, a little much; not a bad beer. Vocabulary word of the day -- Prolix: tediously wordy and prolonged, to the point of being tiresome. Tending to speak or write in such a manner. Don't Even Say It! 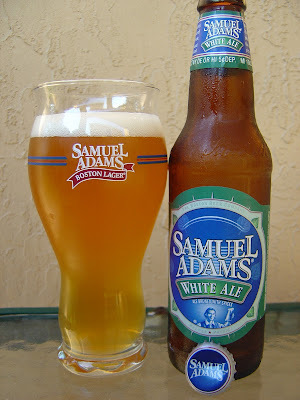 I drank a White Ale over the weekend and really enjoyed it. I must admit it was my first beer of the afternoon and I drank it quickly. I'll have to drink another to see if I experience the "cotton mouth" feel that you did. Good luck to your son's little league. I don't know. I like the flavors, including those from the wheat. I guess it's just that texture that doesn't hit me as very refreshing.